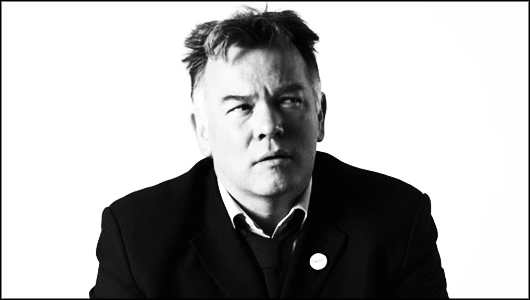 Review: Stewart Lee: Carpet Remnant World – Newcastle Stand. If Stewart Lee’s last show was about what it means to be a comedian then Carpet Remnant World is about what it means to be a comedian who doesn’t get out much. The show was meant to be about idealized notions of society but, he admits, he hasn’t had time to do it properly, what with endless journeys to gigs and caring for two young children. Content, he tells us early on, will be thin and any sense of structure contrived and illusory. Under ten minutes in and we’re already in the hall of mirrors. Structure and content, language and ideas exist to be stretched, layered and made strange in Lee’s world and this show is perhaps his most darkly playful yet. Narrative, deconstruction, commentary, reflection, rant, absurdity and even some straight ahead jokes take their place in this rich meta-comedic mix and it’s only after the event that the thought and intelligence with which Lee has stitched it all together can be fully appreciated. The central premise of the show offers Lee plenty of existential headroom to dissect the struggle to stay fresh and maintain integrity through parenthood, middle-age and his own commercial success. And perhaps it is as a reaction to the higher profile conferred by TV series and awards that he has excised from this show some previously crowd-pleasing elements; the foray into the audience, the closing song, the lengthy “true” story, the moments of startling physicality. Audiences had come to anticipate and enjoy them a little too much, which is why, of course, they’ve had to go. But Lee’s skillful shapeshifting between aspects of his own on-stage persona remains and it’s this that powers the show and holds the material together. Right from the start Lee berates long-time fans for bringing friends who won’t understand the show and through subsequent sections examining American reaction to the killing of Bin Laden and the difficulty of being funny about Islam he regularly pauses to bring “stragglers, friends, new people” up to speed with the workings of his technique. It’s pedantic, sharp and very funny and allows Lee to deconstruct the narrative, split the room and aim precision barbs at various sections of the audience. It’s the lack of a shared collective knowledge that makes it impossible to do meaningful comedy about Islam, he concludes, having described an incident in which his Scooby Doo obsessed son mistakes a woman in a burqua for a ghost. His take on the lazy stereotype-dependent gags of certain other comics is painfully funny and an unanswerable riposte to those who accuse him of political correctness. It’s true to say that there is a certain strain of self-justification in this show whether on accusations of “PC gone mad”, his hatred of Twitter or his lack of new material but each is woven with consummate skill into the whole and given an acute and effective treatment. Lee has great fun dissecting some of the tricks and techniques of certain fellow comics; the ritual addition of a reference to rectal bleeding to revive a flagging joke, “in the trade we call that Boyle’s Law”, and the misery comedy and mining of personal tragedy for commercial ends. Wherever Lee takes aim he generally makes a direct hit but there’s an honesty, a longing for integrity and a back-handed generosity to it all that lifts it far above the level of sniping. And, of course, he is often the subject of his own ire and disappointment. Lee renders his own self-pitying personal narrative by reading out a selection of online comments made about him, some of them quite astonishingly vitriolic, but undercuts this with an entirely incongruous smoochy jazz backing. It’s both grimly funny and personally revealing as Lee admits that knowing such stuff is out there has made him feel paranoid and it gives a certain weight and poignancy to the central conceit of the show. Mid-way through the show, at the end of a particularly funny section on the crass banality and sexism of the Montreal Comedy Festival, Lee offers a subtle callback which is precisely calibrated to elude the vast majority of the audience. Things take a darker turn as Lee ponders the futility of trying to deliver sophisticated comedy to the masses. Through tongue-tied frustration and disappointment he draws out the comedy, pausing, repeating, taunting, beginning afresh, moving through tortured towards something sublime. It’s classic Lee; agonizingly funny, weirdly compelling and peppered with moments of exhilarating connection with the audience. And it perfectly sets up the later sections of the show in which Lee’s struggle to find meaning and inspiration take on a darker and more desperate edge. Tonal shifts from surreal silliness to insane ranting, deft sideswipes at tired observational comedy, sacred cows put to the sword and some deliciously bitter commentary on the struggle to stay alive and funny as a stand-up all find a place within the weave and there is a huge amount to enjoy in this densely packed show. Condensed from the version that toured larger theatres over the year its tighter structure has given greater focus to its interconnected themes and lifted the intensity and energy of the show. As always, full attention is required to appreciate the subtle connections and nuanced ideas at work and Lee pays us the compliment of expecting us to work for the laughs. And laughs there are aplenty. Above all else this is a seriously funny show and the comedy literate crowd in The Stand tonight reacted with delight and total engagement. And so, finally, we’re back on the road with Stewart Lee, searching for inspiration along the side of the motorway. After a hugely entertaining diversion to a psychopathic Dalston butcher and his less threatening counterpart in the Midlands, we’re heading North and weaving together the strands of the show. To a swirling psychedelic backing track Lee takes us at last into that mythic, longed for Carpet Remnant World where dreams come true and finally it all makes sense. Date of live review: Monday 30th July 2012.